Her father, Peter by name, came of a noble family while her mother Petronella, born at Kethel, Holland, was a poor country girl. Both were poor. 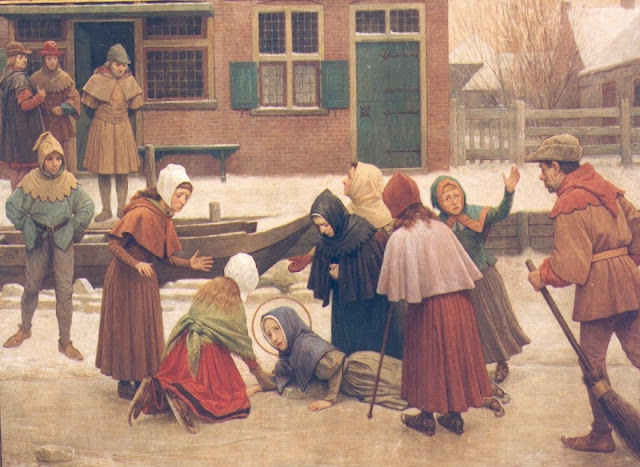 Very early in her life St. Lidwina was drawn towards the Mother of God and prayed a great deal before the miraculous image of Our Lady of Schiedam. During the winter of the year of 1395, Lidwina went skating with her friends, one of whom caused her to fall upon some ice with such violence that she broke a rib in her right side. This was the beginning of her martyrdom. No medical skill availed to cure her. Gangrene appeared in the wound caused by the fall and spread over her entire body. For years she lay in pain which seemed to increase constantly. Some looked on her with suspicion, as being under the influence of the evil spirit. Her pastor, Andries, brought her an unconsecrated host, but the saint distinguished it at once. But God rewarded her with a wonderful gift of prayer and also with visions. Numerous miracles took place at her bed-side. The celebrated preacher and seer, Wermbold of Roskoop, visited her after previously beholding her in spirit. The pious Arnold of Schoonhoven treated her as a friend. Hendrik Mande wrote for her consolation a pious tract in Dutch. When Joannes Busch brought this to her, he asked her what she thought of Hendrik Mande's visions, and she answered that they came from God. In a vision she was shown a rose-bush with the words, "When this shall be in bloom, your suffering will be at an end." In the spring of the year 1433, she exclaimed, "I see the rose-bush in full bloom!" From her fifteenth to her fifty-third year, she suffered every imaginable pain; she was one sore from head to foot and was greatly emaciated. On the morning of Easter-day, 1433, she was in deep contemplation and beheld, in a vision, Christ coming towards her to administer the Sacrament of Extreme Unction. She died in the odour of great sanctity. At once her grave became a place of pilgrimage, and as early as 1434 a chapel was built over it. Joannes Brugmann and Thomas à Kempis related the history of her life, and veneration of her on the part of the people increased unceasingly. In 1615 her relics were conveyed to Brussels, but in 1871 they were returned to Schiedam. On 14 March, 1890, Leo XIII put the official sanction of the Church upon that veneration which had existed for centuries.